Haven't posted in a while and will spare you the explanation, life is busy blah blah blah. I am still collection and got my Black Friday COMC order in the mail this week, plus I am off work until January 2nd so the blogging bug bit me. Before I get to the contest, I have to show off some cards, right? Stick with me or scroll down for the contest details. 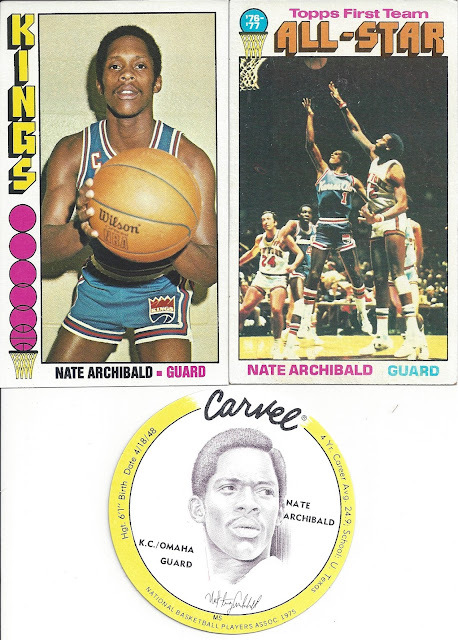 As I was making some Black Friday purchases, I decided to start a new player collection of Nate "Tiny" Archibald. Archibald is a Basketball Hall of Famers and played 14 NBA seasons for the Cincinnati Royals/KC Kings, New York Nets, Buffalo Braves, Boston Celtics and Milwaukee Bucks. My interest in Nate stems from a couple of things. First when I was in middle school, the Kings NBA franchise moved from KC to Sacramento, where I was living. My interest in basketball spiked and seeing the Archibald #1 retired in the rafters at Arco Arena signified he was an all time great to an impressionable newish basketball fan. Over the past few years I have taken an interest in the pre-Magic/Bird NBA and read a few books. The sport wasn't nearly as popular in the 60s and 70s but fortunately a few books have come out about that time and I have enjoyed getting to know about the vintage NBA and ABA. Archibald is typically highlighted in these books as he earned numerous accolades and records during his playing days. His greatness and ties to my favorite franchise got him on my radar. The reasonable prices on his cards and the desire to add some samples of unrepresented sets of vintage basketball cards into my collection resulted in me pulling the trigger. 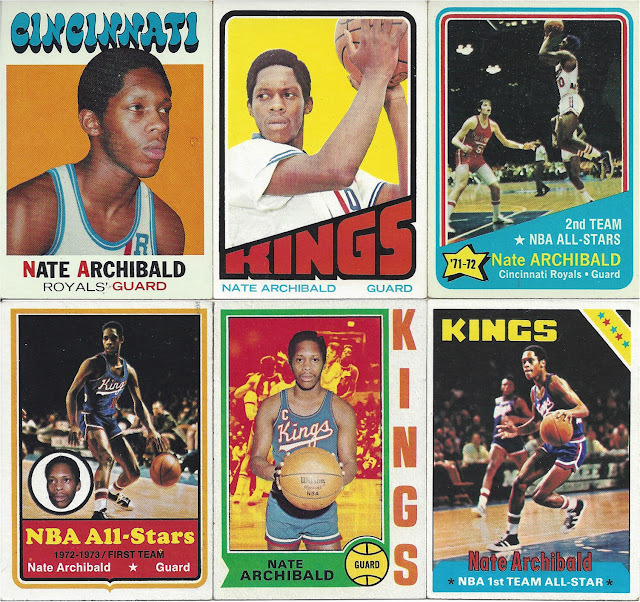 I really love the designs of these Topps cards with his rookie card being in the top left corner (1971-72 Topps) and several All-Star accolades represented during his time on the Kings. I think think the 1972-73 design has to be my favorite. A cool part of going after these Nate cards was having a reason to pick up these oversized issues. While they may be a pain to store, they sure do look great. I was able to pick up the Carvel disc for a fair price and jumped on it. It comes from 1975. 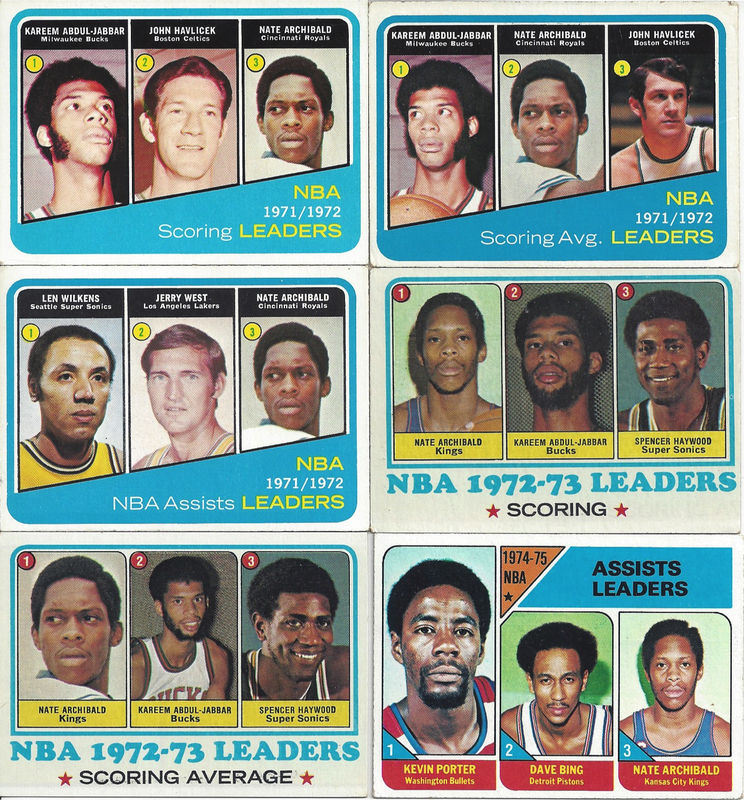 If the All-Star notations weren't enough to demonstrate his greatness, these leaders cards should put it over the top. He is in some great company on these cards. I find it interesting that they celebrated both the guys who scored the most points and had the highest scoring average on separate cards. Finally, here are the post-Kings career cards that I picked up. In all I was able to pick up almost all his cards from his playing career missing out on a Team Leader card from 1975-76 and some oddball issues. On to the contest. I thought I would reward anyone who has stuck with me and left me on their blog role with a contest, actually multiple contests, over the next couple of weeks. The way to enter my contests will be to answer some questions about the recent 387 card order I received from COMC. I will attach a prize to each of the questions and whoever guesses correctly or most closely will win the prize, pretty simple. You can attempt to answer all the questions but once you win one prize, you won't be eligible for the remaining prizes. I will close each of the contests a couple days apart. To win, guess which set currently on my want list is the set I picked up the most cards I needed in this order. The tie breaker will be to guess how many cards I knocked off the want list. Contest #2 - The prize is a junk wax era set of your choice from a list I will provide. I am working through the collection I bought and will have a list available for the winner. The list will certainly include 1986-91 Topps, 1988 & 90-92 Donruss, 1989-91 Score and 1990 Fleer baseball sets and 1990 Score Football. I will probably be able to add more. To win, outside of the 24 Nate Archibald cards I shared above, which one of my player collections received the most additions in this COMC order. The tie breaker will be to guess how many. Contest #3 - The prize is a lot of 25 auto and relic cards. These won't be high dollar cards but great for trades or to include in random acts of kindness packages. I will let you pick baseball or football and will try to include a couple from your team of choice if I can. To win, guess the number of hits (autos and relics) I picked up for my USC Trojan football card collection in this haul. 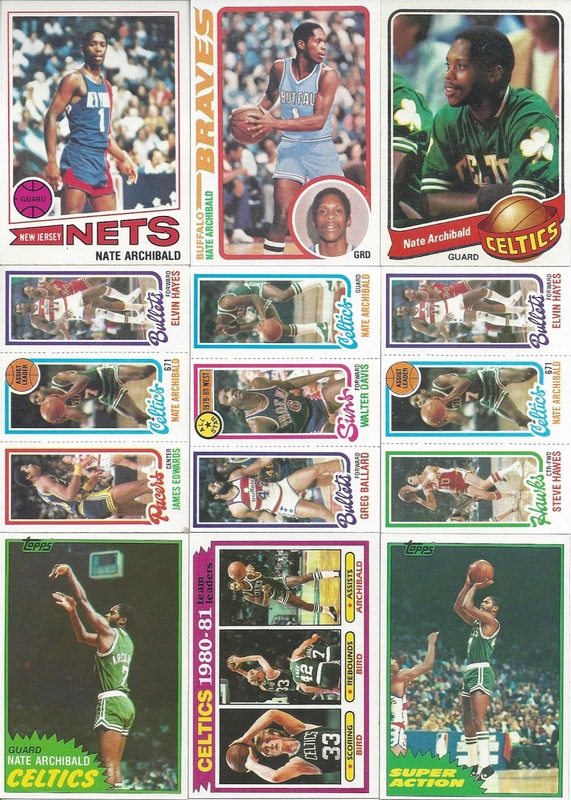 As I hint I will share at 115 of the cards I picked up went into my Trojan collection. To win, pick which brand of cards I picked up the most of for my Giants collection in this order. They were all very recent cards as a hint. The choices are: Bowman Chrome, Bowman Platinum, Stadium Club, Allen & Ginter, Archives, Big League, Chrome, Flagship, Gypsy Queen, Heritage or Museum Collection. The tie breaker will be to guess how many cards of that brand I picked up. Feel free to leave guesses on all 4 contests on this post. I will most likely end the first contest shortly after Christmas then each subsequent one 2-3 days later. Contest 1: 1976 Hostess with 36 adds. Early '70s NBA cards are fantastic. Nice Royals cards by the way. I Found a Local Card Show!